I sit here. Staring at the dashboard. Contemplating whether to actually write about this at all. It’s way past zucchini season for most of us. But there are probably just a handful of you that live at the southern tip of Florida or Texas, who might still be able to get fresh zucchini for a decent price at the farmer’s market. Or better yet, have some still growing in your own garden. So I guess this one is for all my southern friends. For all of you who live where zucchinis are still on the vine! 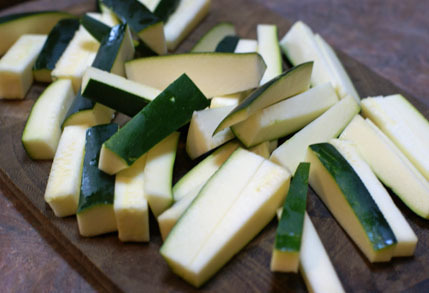 Slice the zucchini into 3-4 inch long slices, about 1/2 inch in diameter or smaller. In a mixing bowl, add the garlic powder, salt and pepper. 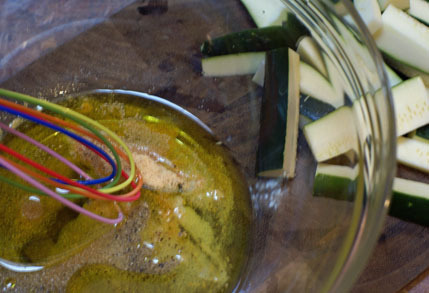 Whisk in the olive oil and vinegar. 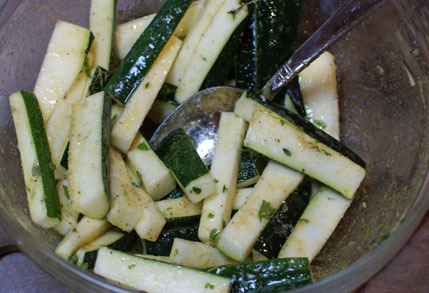 Toss with the cut zucchini strips, then toss with the fresh thyme leaves and chopped fresh parsley. Place into a baking dish, or roasting pan. Roast at 400 for 15-20 minutes, or until zucchinis have softened and that beautiful brown, roasting color appears on most of them. After about 15 minutes, give the roasting zucchini a quick toss to ensure they all get roasted evenly. 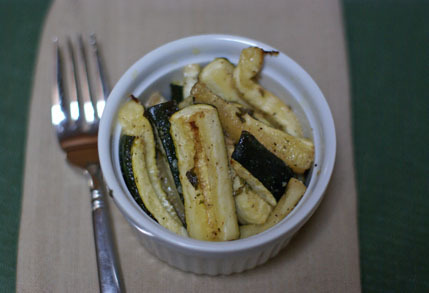 Serve Roasted Zucchini with Thyme as side dish. Guess I’ll have to try it down here at the tip of Texas, then! My own squash plants succumbed to a virus last month, just as they were getting started (fall planting), but our farmer’s market STARTS next week! Glad you posted this. I just picked up some really nice zuc’s at the grocery a couple days ago for 39-cents / pound! This looks yummy! I live just outside Los Angeles, CA and we have a ton of zucchini still, and I’m getting a wee bit tired of zucchini muffins and pancakes! Thanks for posting! Thanks for posting this. 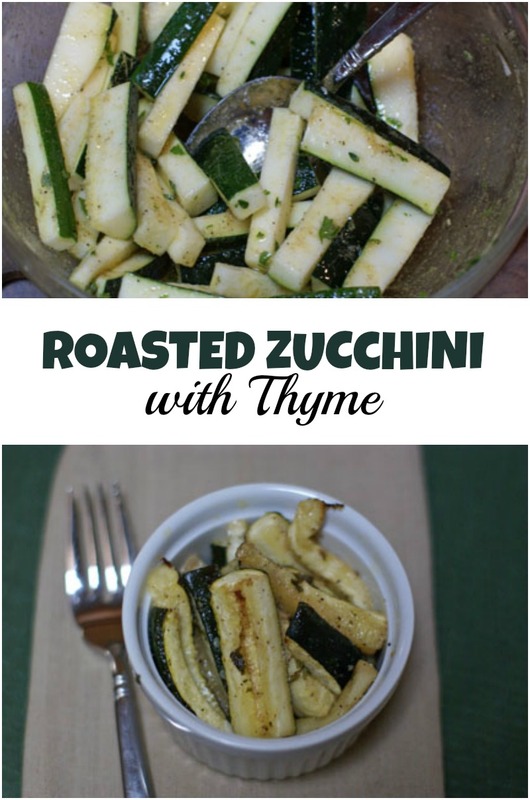 My store has zucchini for $1 each this week… and I’m looking for ways to slip it into our dinners! It’s not something we’ve eaten in the past, … but this looks really yummy!